TJ Logging's Tim White--and his employees--bring their "A" game to the cutblock every day, and it pays off with high productivity in the large diameter spruce and aspen they're harvesting in Alberta. In Tim White's life, there are two seasons: logging season and walleye fishing season. This Alberta logger has a passion for both. When employees come to work for him, White wants them to bring their "A" game because that's what he personally brings to the job at TJ Logging, starting at 6 a.m. every day during peak logging season. White expects a high level of productivity from both his employees and equipment--and generally he gets it. Meeting White in person, it's hard to tell whether he started down the path as a stump to roadside logging contractor last year or 32 years ago, given the level of enthusiasm, dedication, and attention to detail that he brings to the job. The bulletin board of yellow Post-It notes stuck to White's windshield just above eye level in his half-ton truck helps to ensure nothing essential is missed. By his own admission, 2008 and 2009 were two of the toughest years the company has faced given the state of the Canadian forest industry. However, he is genuinely positive about the future and sees improvement. TJ Logging owner, Tim White (right), says his brother, Geordie, is 'the man' when it comes to looking after the business whenever he is away. Geordie has been with the company for 30 years. Their logging volume has been down slightly for the last couple of years from the usual 300,000 cubic metres per year, but 2010 looks like it will bounce back to the norm. 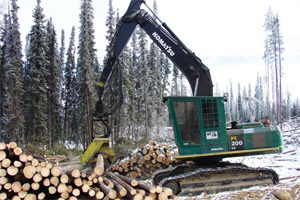 The company's main client is Millar Western Forest Industries, but they also work from time to time for other forestry companies as opportunities arise. Without hesitation, White says his wife, MaryAnn, is a big part of the reason why the business is successful. "MaryAnn oversees the office and is a sharp person," he says, adding that it is key that everyone, from the office through to the bush, works together. "We are a team. People are the most important ingredient in this operation and we have a lot of good people. We have our ups and downs like everybody, but I am proud of the crew we have. "Winter is when we have to rock and roll and we have a crew of guys that know when they have to step it up a notch, and they do." Each morning, Tim, and brother, Geordie, start their day with an equipment inspection. "Geordie is 'The Man'," says White. "If I am not around, he's in charge of all facets of the operation. When I am around, he is generally in charge of the logging and I will float from logging to silviculture to trucks to road building or reclamation. Geordie's been here 30 years, is very devoted and knows what he's doing. He's earned the guys' respect." White's son, Cory, has been around the logging operation since he was five years old and now he's 30. Although he can essentially run any piece of equipment, Cory's specialty is the skidder. White's son-in-law, Greg Fisher, has been with the company for four years and his focus is taking care of the trucks, from the Kenworth trucks to low bedding to picker work. The company operates four Kenworth trucks--two with Vanguard self-loaders to deliver some of its logs to the mill, and two low bed tractors. White further emphasized that the operation takes everyone's effort and that all employees are valued. "We are all a big family," he says. "If we don't work together, we're done before we leave town in the morning." Summer is a bit more relaxed, when Tim and Geordie will take a few more weekends off, especially if there is a fishing derby on the horizon. White handles the company's iron a lot like his employees, making sure they are well looked after and ready to work. "Maintenance is huge in this operation," he explains. "In the spring, we spend a lot of time doing maintenance. We spend a lot of money doing maintenance, and we've stuck with it. "I think in the long run, it has paid off because when we go to work, we are ready to work with the equipment, not fix the equipment. If we don't take care of the machines, they won't take care of us." 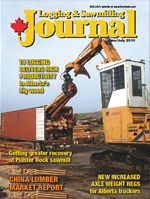 Lately, because of the economy, TJ Logging has been holding on to its equipment a year or two longer. But because of their maintenance program, uptime has not been an issue. Also, White says it helps that today's logging equipment is more reliable and durable. TJ Logging is a very diverse logging contractor, harvesting both hardwood and softwood, and is able to deliver softwood in both tree length and cut-to-length measurements. "There's no junk out there any more," he says. "Everybody builds something that is fairly good, but some people build machines that are very good. There isn't a machine on this job site that hasn't been demo'ed originally. We don't buy anything without trying it first. If it's new, we've tried it, and if it's proven, we will buy it." Although customer service from equipment suppliers is still king at TJ Logging, there are new issues that also factor into equipment purchases these days. "Something that is a bigger item than in years past and is becoming more and more of an issue is keeping the operators comfortable these days," says White. "The manufacturers that do that are going to sell machines. John Deere has, specifically, stepped up to the forefront in recent years and I think they are doing a pretty good job at keeping operators comfortable." TJ Logging's fleet includes of two John Deere 953 feller bunchers. White says he opted for these larger feller bunchers because their wood diet consists of larger diameter spruce and aspen. About 60 per cent is aspen and 40 per cent spruce. They average about 1.8 trees per cubic metre of aspen and three trees per cubic metre of conifer. They also have an older Timberjack 618 feller buncher that fills in as necessary. Complementing the feller bunchers are three John Deere 748 skidders. Their newest piece of equipment is a Waratah 622B processor on a Komatsu 200 carrier. That's because the company's contract includes both tree length and cut-to-length conifer, and the processor takes care of that volume. "I don't know how many Komatsu carriers we've had over the years--it's got to be 20-plus," says White. "I'm completely convinced of the reliability and durability of Komatsu carriers. As far as the Waratah processing head, they are very reliable and well-built. They do what they are supposed to do and they last in this rugged business." 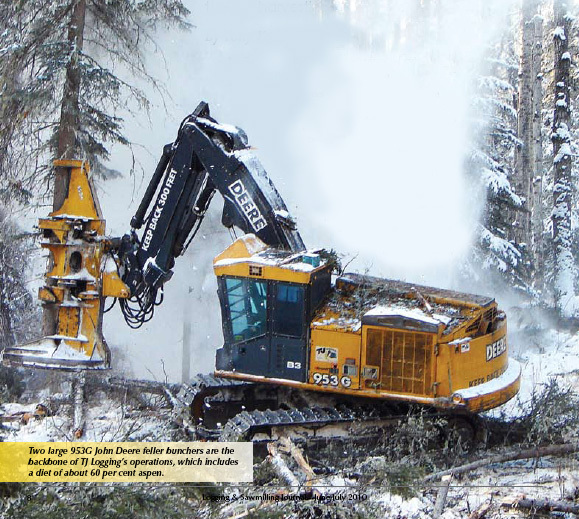 One piece of equipment working at roadside that stands out as different by today's logging standards is the company's three Cantrac delimbers. TJ Logging has been operating the Cantrac units for 15 years. All three have been rebuilt at least once and each is mounted on a Komatsu 220 carrier. "We redid everything on the latest Cantrac delimber that we rebuilt at our own shop a couple of years ago," says White, "and we tweaked a lot of things that annoyed us over the years to make this machine run better. It has performed very well." The oldest Cantrac has 53,000 hours on it after being refurbished at 23,000 hours, and is mounted on its second carrier. It suits their particular operation because White says the Cantrac performs equally well on a steady diet of big, ugly aspen or smaller wood. "They are a simple machine, and as delimbers go, they are as reliable as a delimber gets," he says. White says he believes only 14 of these delimbers were ever actually manufactured. by a company in Quebec. Their road building fleet consists of two Komatsu 155 double-shank ripper dozers, a Komatsu D65 dozer, and a Komatsu D61 dozer with wide pads that they use to freeze up roads in swamps, thus providing them with early access to some cutblocks. They also have a Komatsu 270 backhoe. This part of the fleet is among the busiest, operating from June till March in both road building and reclamation work. "In addition to the road building reclamation work we do as part of the 300,000 cubic metres that TJ Logging does for Millar Western, we also do extra road building reclamation work for other mills and logging contractors, amounting to about 200,000 cubic metres of extra work ," says White. Taking on silviculture work is a relatively new service offered by the company but it has turned into a regular stream of business. They use a Komatsu 155 dozer pulling a custom-built silviculture ripper plow manufactured by Craig's Welding to help eliminate competition in some cutblocks and to disperse some of the residual wood fibre, so that planted trees have a better growing environment. The company does about 250 hectares per year of this work for Millar Western. The Whitecourt area is only now starting to feel the effects of the mountain pine beetle and companies like Millar Western are starting to ramp up their harvesting programs to manage the beetle infestation as best they can. TJ Logging does not expect it to have a severe impact on their operations and expects that the impact it does have will be similar to salvaging wood in a fire burn. They have plenty of experience doing that; at one time, they spent two years salvaging wood in a burned area near Swan Hills. TJ Logging's philosophy is that by going hard every day during peak season, the company is able to take advantage of opportunities to harvest more volume as it becomes available. In a sluggish economy where contractors are working hard just to hold on to what they have, that little extra means a lot. "We are prepared to take advantage of that extra volume and over the last 32 years, we have," says White. "When a forest company has 20,000 or 40,000 cubic metres here or there that they need harvested, we can take care of it. If you're behind, you can't take care of it." Benefits and productivity improvements are on the way for Alberta truckers as a result of new increased axle weight regulations in the province. The Fraser Papers' sawmill at Plaster Rock, New Brunswick has seen some significant recent upgrades that are generating greater recovery and higher lumber production numbers, and has a new KMW boiler fuelled exclusively with bark from the sawmill operation. With rising energy prices, bioenergy has been getting a lot of attention lately. But a large stand-alone operation in BC--Capital Power (formerly EPCOR)--has been successfully powering along since the early 1990s, and these days its fuel source includes volumes of mountain pine beetle killed fibre. Logging and Sawmilling Journal's authoritative report on the Chinese lumber market, and the do's and don'ts of exporting to this incredibly fast-growing market. An upgrade to the Enligna Canada wood pellet operation in Nova Scotia will deliver better efficiencies and result in an increase in production of 25,000 tonnes. Logging and Sawmilling Journal has the latest equipment information in this issue's Tech Update on harvesting and felling heads. The Resources Expo 2010 show held in June in Prince George, B.C., proved to be successful in drawing together the major decision-makers representing the region's natural resource industries including, of course, the forest industry. Jim Stirling talks about how the long term sustainability of B.C. 's forest lands is not a Liberal government priority.